Hopefully you can see some fine white branches sprouting from a root at the lower right corner of this liquid surface. The object pictured is a cup of coffee with artificial cream added to it. I happened to notice it after the coffee had stood quietly cooling for an hour or so. It seems probable that the white deposit marks a stagnation zone of a convective flow. The strange thing is that it takes this strange branched shape, which singles out a point on the edge at random. One is led to think that the process that generates the deposit starts at the root and grows out and branches after that. But look how straight and well-aligned the branches are, completely ignoring the circular boundary of the cup. The depth of the coffee is about a centimeter. The width is 8-10 centimeters. this cup is flared outward at the bottom. The sides are not vertical but meet the bottom at 110 degrees instead of 90 degrees. There is more to be observed. If one looks closely at a single branch, one notices a fur of many fine sub-branches radiating from it. This pattern looks similar to dielectric breakdown patterns induced in a charged piece of plastic. You may not be able to see this fine structure in these images, but it is very striking when viewed directly. Here is a possible explanation. 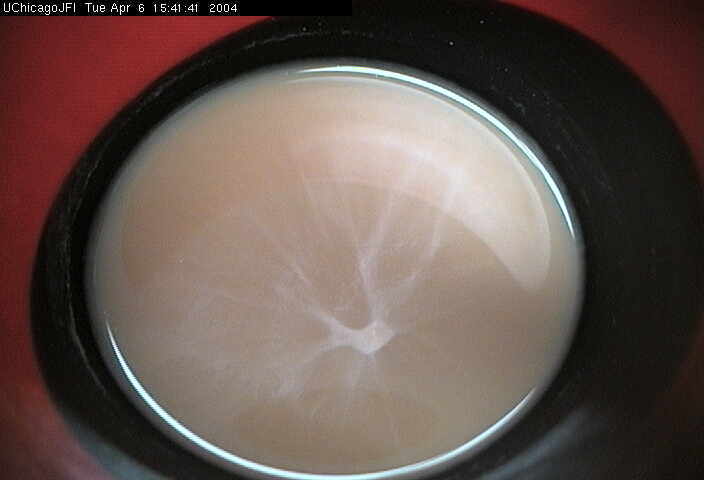 The cooling coffee is unstable against Rayleigh-Benard convection. The convective downflow starts at the root position. The circulation of the rolls is in the plane of the walls, so that the locus of the downflow is perpendicular to the wall. Once the rolls have nucleated, they expand laterally inwards toward the center, thus extending the downflow line. Surface particles flow inward towards the downflow line, but are supposedly too bouyant to be pulled down. So they congregate along the locus of the downflow line. The branching of this line must mean the branching of the rolls beneath it. The two branches seem to be at nearly right angles to each other. The distance between the branches appears to be roughly equal to the depth. As the two main branches grow farther apart than this, there is room for more convective cells at this spacing, and thus further branching event occur. Oddly, these sub-branches don't affect the direction of the main branch. Maybe they formed after the main branch had completely grown. Ultimately the coffee cools and the convection slows down. Then more subtle effects have a chance to assert themselves. One of these is marangoni flow of the white surface species that form the visible pattern. If these species are charged, it might explain the spikey appearance. Another possible explanation is that the white species have some other repulsive interaction. Clearly the width of the spikes is far smaller than the depth of the coffee. It's hard to account for their thin-ness and straightness without supposing some body repulsion of the white species. It seems important to account for this fine length scale. 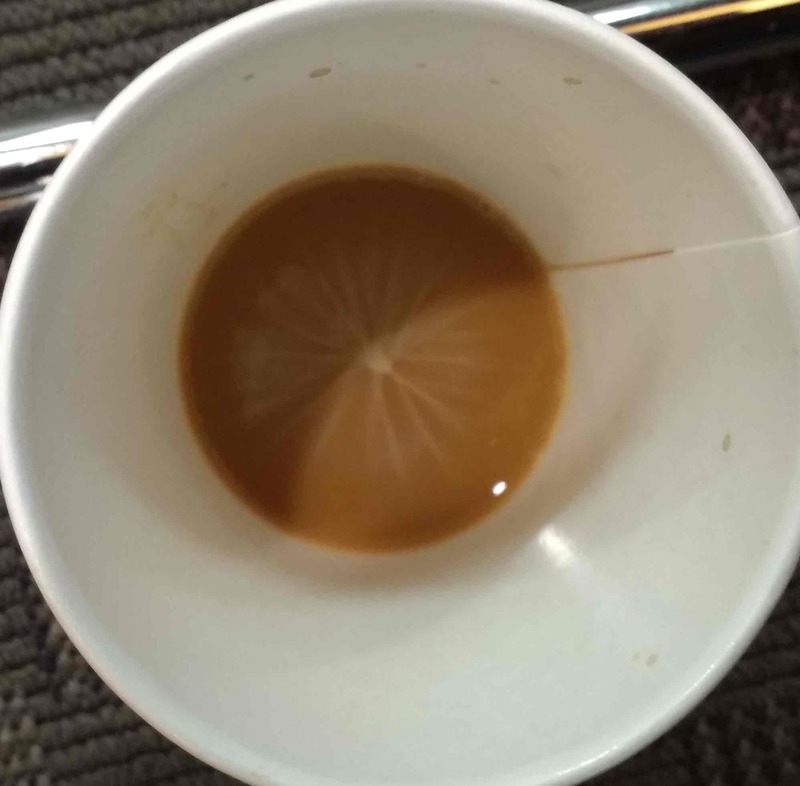 This whole pattern eventually degrades into a more amorphous blob near the center of the cup. This pattern is a familiar sight in coffee cups, and is shown below. It still looks like a caustic, like the pattern of sunlight cast on a surface from a badly-focussed lens. It too is something of a mystery. Some vestige of the spikes is still visible in the form of rays radiating from the central blob. They are still very straight and have numerous fine, faint sub-branches. Is this understood? ...produced much like the pictures above. The bluish regions are just due to reflections. 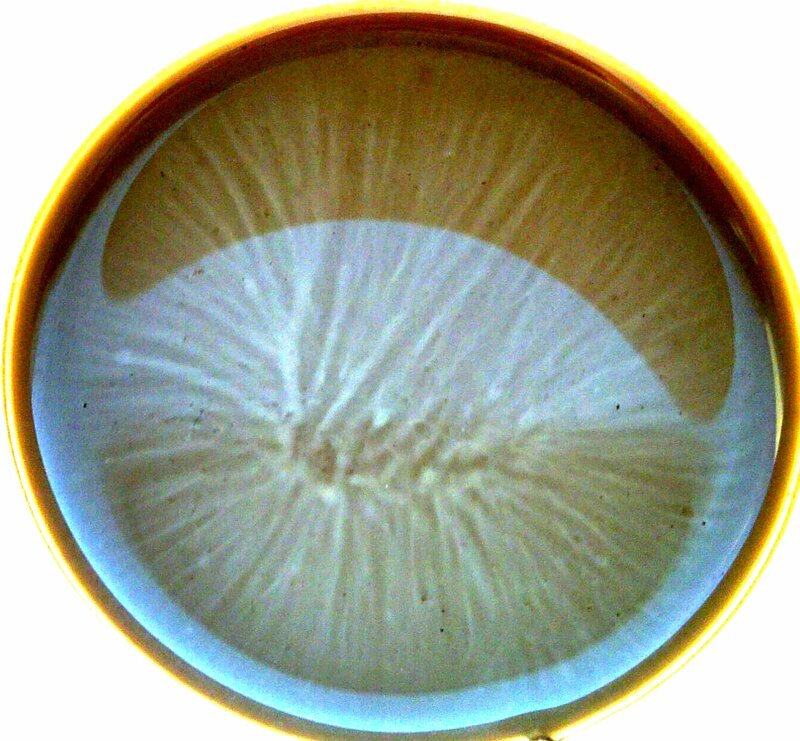 This is a time-lapse movie showing the formation of a central milk pattern in a cup of coffee, compressing ~6 hours into ~6 min. The coffee volume is tapered from D= 4 cm (bottom) to 6cm (top), with a height of ~ 4 cm. One can see how the colloidal suspension (milk) first starts to aggregate more or less uniformly over the surface. 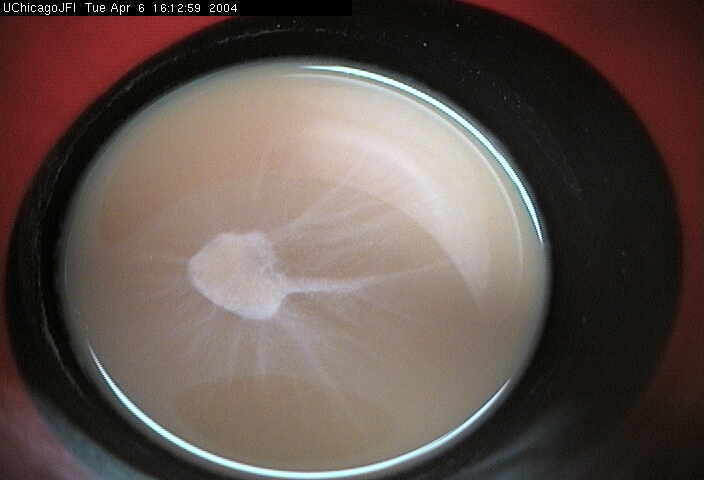 After about 1 hour, thin white "tendrils" appear on the coffee surface and a white patch ("blob") is being "woven". The patch then evolves toward the center of the cup, being continuously "anchored" (and possibly fed?) by the tendrils. 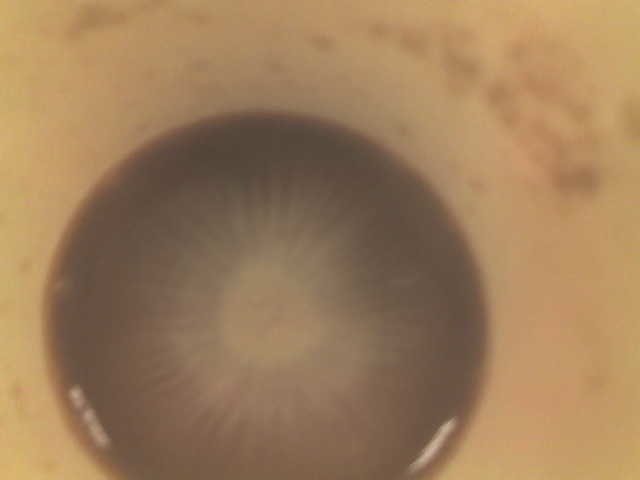 "I thought you might be interested in this photograph I took today [24Oct 2014] of the bottom of a cup with I assume to be dried coffee rather than tea. I believe it had been sitting on a shelf for at least a year in our air conditioned office. Temperature is a steady 21-22 C. From the tide marks on the inside of the cup there looks to have been around 1cm of coffee originally." Robert Deegan's time lapse movie. about 4 megabytes Deegan's original "Feel free to put the movie on the webpage. The conditions were similar to the ones you suggested: ~1.5cm of coffee + 2% milk at the bottom of a cup with 45^o walls. Pictures were taken every 15 secs, and played back at 6 fps. (Not sure about these last numbers; I'm at home now but will double check later). As a side note, the sloped walls are unnecessary." "Am currently at Aspen for a cell motility workshop. Left a cup of coffee (with half and half) with about an inch of coffee at the bottom on my desk for a day. I just saw this pattern (central white core with radiating arms in a star like formation) and figured you would know why :) Best Ajay"
Apart from the people featured above, here are some more people who are interested and who have been playing with this effect. Write email to appear below.